SUMMER SAVINGS PASS – ON SALE NOW! SUMMER SAVINGS PASS = FOUR ATTRACTIONS + FOUR MONTHS + ONE LOW PRICE! Treat your family to a fun-packed summer with a SUMMER SAVINGS PASS! For one low price, enjoy unlimited admission May 12 through September 30 to four great South Florida attractions — Lion Country Safari, Miami Seaquarium, Museum of Discovery and Science and Zoo Miami. $58 (plus tax) per adult and $48 (plus tax) per child. Museum members save an additional $25 off prices. Call 954.713.0930 to speak to a reservations agent. You can pick up your Summer Savings Passes at our Box Office Will Call. You can have your Summer Savings Passes mailed to you via Certified Mail. Click here to purchase Summer Savings Passes for Will Call Pick-Up. Click here to purchase Summer Savings Passes for Certified Mail Delivery. Only the purchaser may pick up a Will Call order. A valid photo I.D. is required. A Certified Mail fee of $2 per pass will apply for all on-line mail orders. Please allow seven business days for delivery. 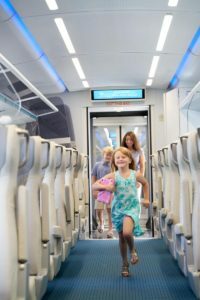 Take advantage of Brightline’s current promotion that lets kids under 13 ride free between Fort Lauderdale and Miami/West Palm Beach in SMART coaches.